Reunions happen all the time in jazz. 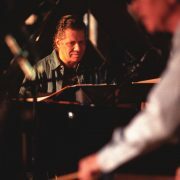 But in mid-2006, when Chick Corea and Gary Burton announced their intention to get back together, it started a buzz. The duo’s 1972 ECM album Crystal Silence occupies a special place in jazz history. If you are a jazz fan who is old enough, you either owned that LP or knew someone who did. It was one of the earliest successful manifestations of an art form that came to be called chamber jazz. Crystal Silence was often playing in the background in the early ’70s, one of the soundtracks to that era. Corea and Burton made four more albums over the following 35 years (three of them duets), and performed together at least once every year. But their new joint project has been greeted as a major reunion event because of its scale. In 2007 they gave 75 duo concerts all over the world. And now there is a double live album, The New Crystal Silence. One CD was recorded at the Molde Jazz Festival in Norway with the duo alone, and one was recorded in Australia with the Sydney Symphony. What has always made this duo magical comes flooding back with “Bud Powell,” the opening track of the Molde CD. First, there is the virtuosity with which they spontaneously intertwine complex ideas at high speed, responding to one another with the reflexes of superstar athletes. Second, there is the pure ear candy of their particular timbral blend, the glittering treble richness of piano and vibes alone together. (Early ECM sound was excellent for its time, and the duet CD here, recorded by Bernie Kirsh, is better.) Third, and most important, there is the updraft of affirmational energy, the infectious joy that these two take in playing together. Jazz does not get more optimistic than Corea/Burton. The Molde CD revisits classics of the duo’s repertoire like “La Fiesta,” “No Mystery” and “Señor Mouse.” The new versions all feel faster, denser, more intricate. Corea and Burton seamlessly trade lead and accompanist roles, or submerge those roles in concurrent crystal cacophony. The duet CD also offers their first ventures into standards. It is fun to hear Bill Evans’ “Waltz for Debby” transfigured into a dizzying harmonic maze, and also to hear “Sweet and Lovely” restated in the duo’s proprietary quicksilver language. “I Loves You Porgy” reveals the surpassing cleverness with which these two can jointly reimagine a melody, and also reveals the limits of their emotional range. It would be unfair to expect them to use Gershwin’s song as a vehicle to probe depths of the soul. Such explorations are not what this duo is about. The pathos of the plea in “I Loves You Porgy” is nowhere in their bright, airy exercise. It would also be unfair to expect a masterpiece from the orchestral CD. Corea admits it was done as an “experiment,” with minimal rehearsal time. All five pieces recorded with the Sydney Symphony are staples of the Corea oeuvre and all appear on earlier albums by the duo: “Duende,” “Love Castle,” “Brasilia,” “Crystal Silence” and “La Fiesta.” The new arrangements and orchestrations are by Tim Garland, who plays reeds in Corea’s band Origin. Garland’s challenges are nothing less than to organically integrate two deeply dissimilar ensembles (one macro, one micro), and to incorporate jazz improvisation into a symphonic setting. The pieces that come closest to working are “Brasilia” and “Crystal Silence,” where Garland uses the orchestra with restraint, mostly for background color and texture. “Crystal Silence” stays ethereal for 14 minutes, the massed violins whispering all around the penetrating voices of Corea and Burton. On the other three pieces, the two ensemble entities neither cohere nor meaningfully enhance one another. The best Garland can do is let the orchestra and the duo take turns and coexist relatively peacefully.